UK Fire Legislation requires all employers to ensure that all employees are provided with adequate fire safety training on Induction and at least annually. Fire safety training should include: Action on hearing the fire alarm, Action on discovering a fire, Safety features within premises, Calling the fire service, safe evacuation & types and use of fire fighting equipment. 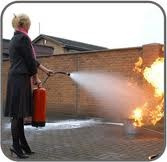 Onguard Fire Protection provide Fire Safety Training courses to suit your Businesses needs including Fire Safety Awareness Training and Fire Warden / Marshal Training. We provide the courses at your premises from 6 persons upwards. • Short examination / test.